Control Universal was founded in 1978 when its first activity was as a sales outlet for Rockwell Microcomputers, a role which actively continues. Since then the business has extended into the sale of Acorn products, a wide range of peripherals such as visual display units and printers, and then into own manufacture of the CUBE range of Eurocard Computer Units, such as CUBIT, CUMEM and The Industrial Cube. In addition, Control Universal have performed full range design and manufacture projects for clfents who have wished to use microcomputer technology in applications as diverse as Electronic Dart Scorers, Foreign Exchange Calculators and Pharmacist's Prescription Analyser and Label Printer. In some cases these projects have included every aspect of design from system concept, styling of the enclosure, mechanical production, circuit board layout, electronic manufacture and test. In 1981 the Company moved from Harlow into much larger premises in Cambridge. 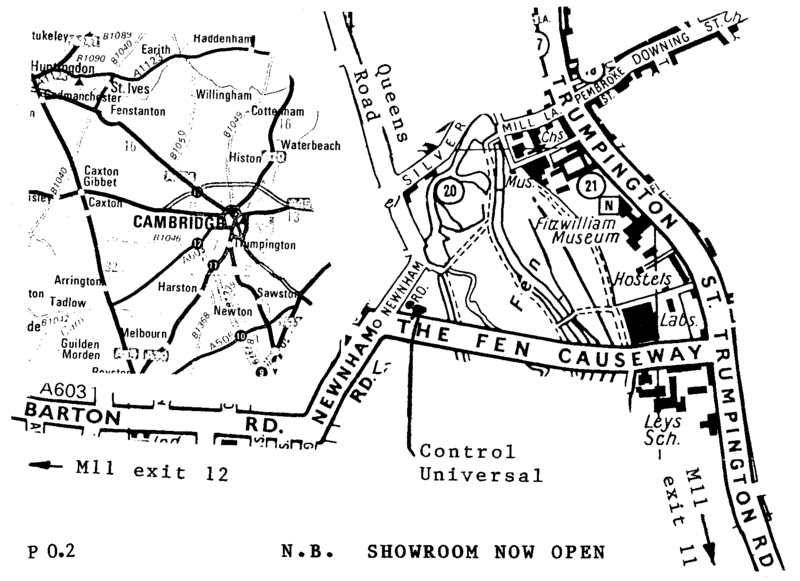 In addition to appreciating Cambridge as one of the country's most attractive towns, the Directors recognised the advantage of being located close to both the advanced research taking place at the University and to other leading companies in the Microcomputer Industry, Acorn in particular. The future is seen as holding exceptional opportunities for even more dramatic increases in activity, with particular emphasis on increasing the range of CUBE cards, on local area networks for the control of peripherals and input/output units, and upon industrial applications generally. 1. PRICES. All prices quoted are exclusive of VAT. Currently 15% is charged on all items except books, which are zero rated. Products which include documentation have VAT levied on the whole price for the product. 2. DELIVERY CHARGES. Postage, packing and insurance charges are added to credit card and credit account orders, but are free on orders paid in advance. 3. PAYMENT. Access, Barclaycard and Visa are accepted as payment. Credit accounts are opened on the strict understanding that invoices will be paid within 30 days of presentation. The payment terms must be observed for all goods delivered, and there is no entitlement to delay payment on the grounds that an order is not complete. 4. TITLE. Control Universal Ltd retain title to all goods until paid for in full. 5. COPYRIGHT WARNING. Copyright restrictions exist on all hardware designs and software in products sold by Control Universal Ltd. The price paid entitles the purchaser to make use of or sell the item bought, but does not include the right to make any copies. 6. GUARANTEE. All products sold by Control Universal are guaranteed for 90 days from the date of delivery, and will be replaced or repaired in the event of a failure being due to the supply of faulty materials or workmanship by Control Universal Ltd.
7. LIABILITY. All sales are made by Control Universal Ltd on the strict understanding that any liability for any consequential loss is excluded. The Control Universal Range of Computer Units in Section 2 is subject to a quantity discount according to the following table.